Just months ago, the prospect of a no-fly or “buffer” zone for protecting Syrian civilians was roundly rejected by just about everyone. British Foreign Secretary William Hague said in early August that a U.N.-sponsored military action in Syria was “not a remote possibility.” Anders Rasmussen, the Secretary-General of NATO, was asked in Tripoli in November if a round-two interdiction might be in the offing in Damascus: “My answer is very short,” he answered. “NATO has no intention [to intervene] whatsoever. I can completely rule that out.” For a while, the Syrian opposition agreed; the formative charter of the Syrian National Council (SNC), the aspiring government-in-exile, ruled out not only “foreign military intervention” but also “armed resistance” of the sort now on display—and on the rise—in the Syrian city of Homs. But in recent weeks, the attitude of many of the invovled parties appears to be subtly changing. With the civil war in Homs now threatening to ensnare the rest of Syria, there’s been a detectable shift in rhetoric on the part of both the opposition, the Arab League, and Western governments on the subject of intervention. The Syrian opposition consists of two camps, but both are moving towards an open embrace of military assistance for their cause. The more militarized group is the Free Syrian Army (FSA), a phalanx of rebel soldiers said to number as many as 15,000 which has performed both defensive and offensive operations inside Syria. (Sources within the opposition tell me that some of the more daring and high-profile raids, such as the attack on Ba’ath party offices in Damascus and on an Air Force intelligence compound in Harsata, were only loosely affiliated with the FSA, having been conducted instead by independent local “brigades”.) On November 24, FSA-leader Colonel Riyad Al Asaad called for aerial bombardment of “strategic targets” inside Syria. “We also want international protection, the establishment of a no-fly zone, a buffer zone, and strikes on certain strategic targets considered as crucial by the regime,” Al Asaad said in an interview with Agence France-Presse. Another creeping advocate for intervention in Syria is Turkey, whose belated backing of regime change is motivated as much by national security concerns as it is by humanitarianism. 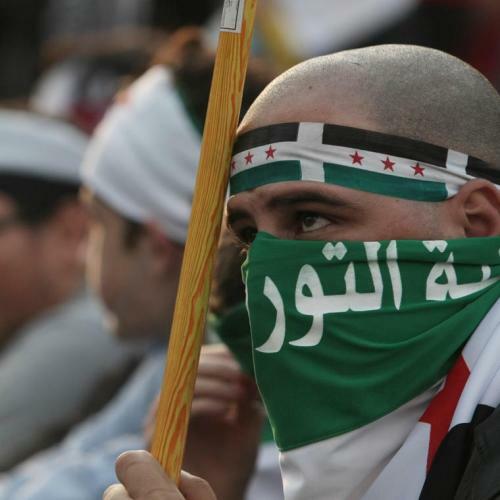 The Assad regime has been outraged at Ankara’s support for Syrian dissidents, including its hosting of the SNC; recently, the hostility has escalated into outright enmity. Last month, pro-Assad loyalists in Syria stormed the Turkish embassy in Damascus and launched separate attacks on the Turkish consulates in the cities of Aleppo and Lattakia. On November 21, Syrian security forces fired on a bus convoy of Turkish hajj pilgrims en route back from Saudi Arabia that had taken a wrong turn into the city of Homs. In response, Turkish Prime Minister Recep Tayyip Erdogan delivered a blistering televised speech comparing Assad to Hitler and Qaddafi and calling on him to step down immediately. Turkey also reaffirmed its right to impose a “buffer zone” inside Syria to safeguard civilians. Finally, the United Nations, too, appears to be gearing up for a more robust approach to Syria after several attempts to secure a U.N. Security Council Resolution condemning Assad for violence and calling for an independent fact-finding mission failed, thanks to Russian and Chinese recalcitrance. Speaking in Geneva on December 2, the U.N. High Commissioner on Human Rights Navi Pillay told the Human Rights Council, “in light of the manifest failure of the Syrian authorities to protect their citizens, the international community needs to take urgent and effective measures to protect the Syrian people.” Pillay’s remarks follow the Council’s damning accusation that the Assad regime was guilty of crimes against humanity, as well as a U.N. General Assembly resolution passed on November 22 condemning Damascus for “grave and systematic human rights violations.” Co-sponsored, remarkably, by Saudi Arabia, Bahrain, Qatar, Jordan, Kuwait, and Morocco, the resolution was intended as a direct rebuttal to Russian and Chinese intransigence to pass a similar resolution at the U.N. Security Council. Of course, it’s exceedingly unlikely that the Security Council, where Russia and China have veto power, will pass a resolution condoning the use of force against the Assad regime. But that kind of obstruction may only convince the growing anti-Assad coalition to bypass the Security Council altogether. There is, indeed, a precedent for gaining the U.N.’s backing for a military mission by means of a resolution passed by the General Assembly, where no single country has a veto: the so-called “Uniting for Peace” resolution (377 A), which was established and successfully used in 1950 to fight the Korean War after repeated Soviet obstructions in the Security Council. Nicknamed the “Acheson Plan” after then-Secretary of State Dean Acheson, the resolution allows for “collective measures” to halt hostilities, including the “use of armed force.” Though procedurally complicated, “Uniting for Peace” could be feasible in light of the earlier General Assembly resolution against the Assad regime. What’s clear is that the status quo is not sustainable. As long as Syria continues to teeter on the brink of civil war or failed statehood, the demand for intervention is bound to increase. The only question is when the international community will muster the political will and the institutional creativity to put a stop to the carnage. Michael Weiss is the communications director of the Henry Jackson Society, a London-based foreign policy think tank.